NAVIGATION - CLICK BOX ----It is also in the top & bottom black bars or in the top [3 bar menu]. 9095 Horolovar rotary pendulum clock. This clock was made in the 1970s by Charles Terwilliger and the Horolovar Clock Co. of Bronxville, NY. 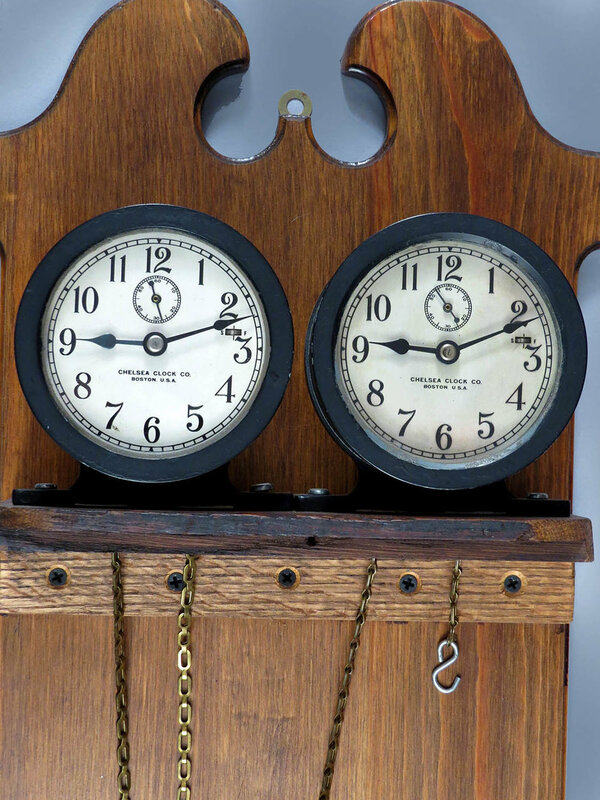 They made this reproduction clock and others, like the Ignatz flying pendulum. 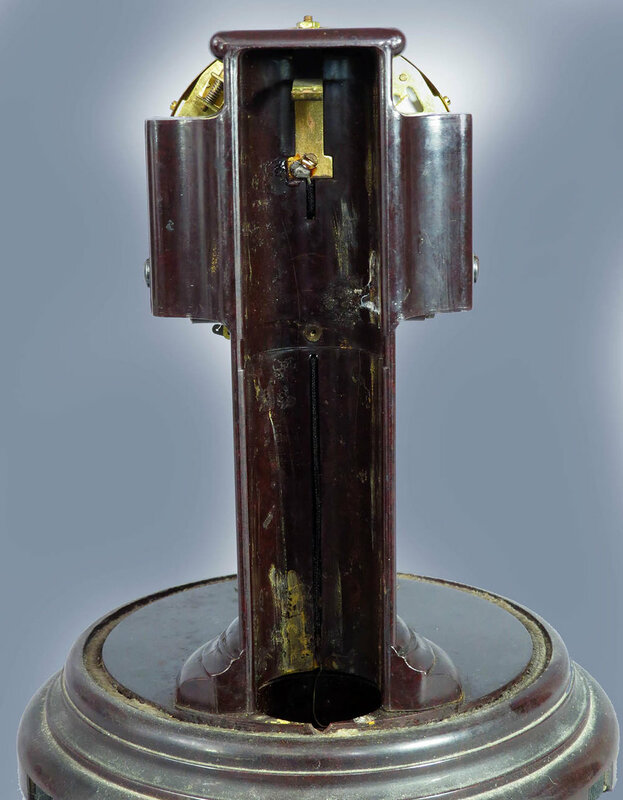 This one was modeled after the Briggs rotary pendulum clock made about 100 years earlier. For some reason these clocks are often found in rather rough condition. They are very captivating when they are running so perhaps children cannot resist handling them. This one is the exception because it looks like it just came out of the box. The walnut wooden base, dial paper and polished brass plates are just about perfect and it comes with the original glass dome. The pendulum is suspended from a silk thread and a wire arm gives it an impulse so it swings in a circular motion as the clock runs. The clock is wound by means of a four armed wheel under the clock base. I believe the original models were 30 hour clocks but this one runs a full week for me and it seems to be in good running order. Guaranteed to please anyone and it would make a great gift. made in Ithaca, New York. 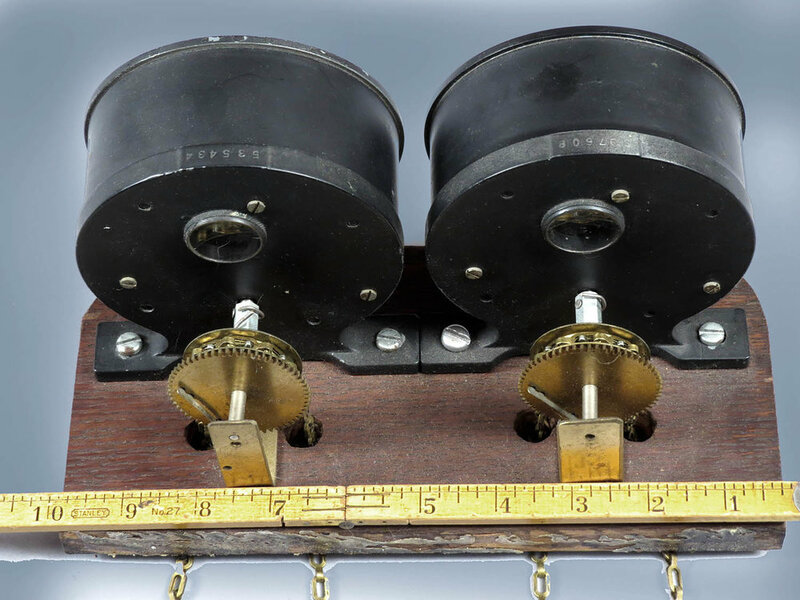 9096x Poole electromechanical clock made in Ithaca, New York. This is a very clean example of this clock. The composite base is in good condition without any chips. The only question I have is regarding the rear of the clock. I do not remember if there is supposed to be a cover over the battery section. The signed and silvered dial is an exceptionally good condition with a separate seconds dial and it has a brass dial surround. The hands and distinctive brass pendulum are the originals plus it has what I am sure it is the original glass dome. As a bonus, the clock comes with the original 10 page booklet illustrating the various Poole models, including this one, which happens to be model No. 5. This clock operates with power from three size D batteries. I have not tried running the clock. 9 inches tall without the dome, 10 inches with the dome. $155. 9097 Unusual pair of Chelsea clocks. I really do not know how or where these clocks were intended to be used. Someone attached them to a board as a pair but they could just as well have been intended to be used independently. One has a serial number of 535434 and the other 597608 so they were produced in the late 1940s. I think the housings are aluminum with an aged bronze finish. There are no case problems or damages to either clock. The front of the clock unscrews to give access to the dial and hands. As can be seen in the photos, a direct drive shaft comes out of the back and is attached to a gear. What that gear was intended to drive, I do not know. These clocks have a jeweled lever balance escapement and they are weight driven with chain pull up. I did not get weights with the clocks but just a pound or two of pressure on the chains starts both clocks running immediately. Both clocks have nearly perfect dials and the original hands. It is hard to estimate how long they will run with the amount of chain provided but eight days sounds reasonable. 4 ¾” tall without the wooden base. 3 ½ inch dials. $175. 9098 Unusual reproduction water clock. I think these were made in the 1960s or 70s and they are a copy of an ancient water clock or clepsydra. 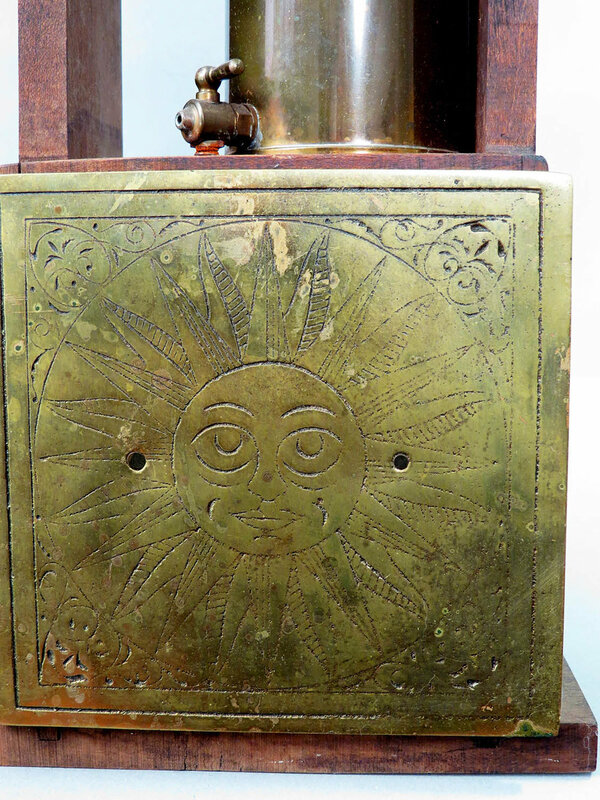 This clock has a wooden frame and a solid brass dial, hand, tank and reservoir. The central cylinder brass tank is filled with water and a wooden float at the top is attached to a chain which goes around a gear to move the single hand to tell the hours. An adjustable spigot at the bottom of the tank allows water to drip out into the reservoir below. As it drips, the float lowers and the hand advances. The water is held in the reservoir and simply reused when the tank is empty. All of this is in good condition and it should be a working clock though I have not tried it. It makes for an interesting conversation piece. 9099 French carriage clock with case. This is a good, original clock in better than average condition, needing no attention. It is ready for you to put it on your shelf. The solid brass case is nicely polished, has an excellent finish and is without any dents or scratches. All four beveled side glasses are perfect while the top glass has one tiny pinhead size chip in one corner. 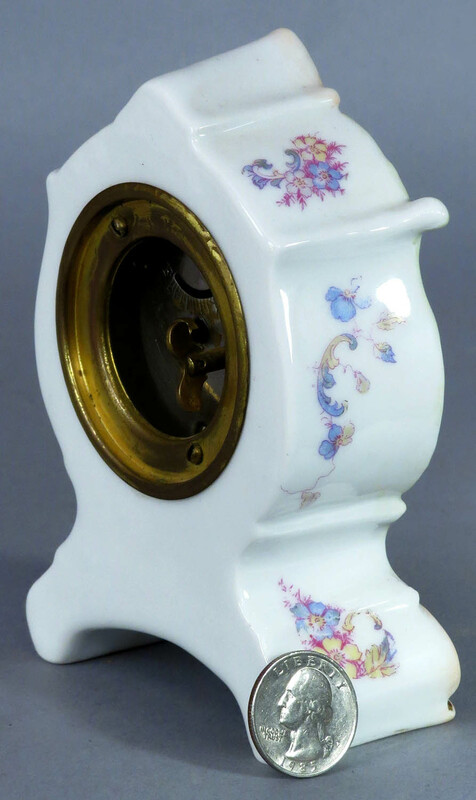 The porcelain dial has one flaked spot at the very outer edge, not really visible from the front. The center of the alarm dial has some hairlines. This clock comes with the original leather covered wooden carrying case with an interior silk label from “J. E. Caldwell, 902 Chestnut St., Philadelphia.” It retains the original glass plus a maroon velvet padded interior. Much of the leather covering is gone as is almost always the case. The clock fits the case perfectly so I am confident they are original to each other. This is an eight-day timepiece plus alarm with a jeweled platform balance lever escapement. The one time I did test it, it ran just under eight days. The alarm is working and it has the original hands. At only 4 inches tall with handle, it is hard to appreciate from the photos how charming this little clock is. 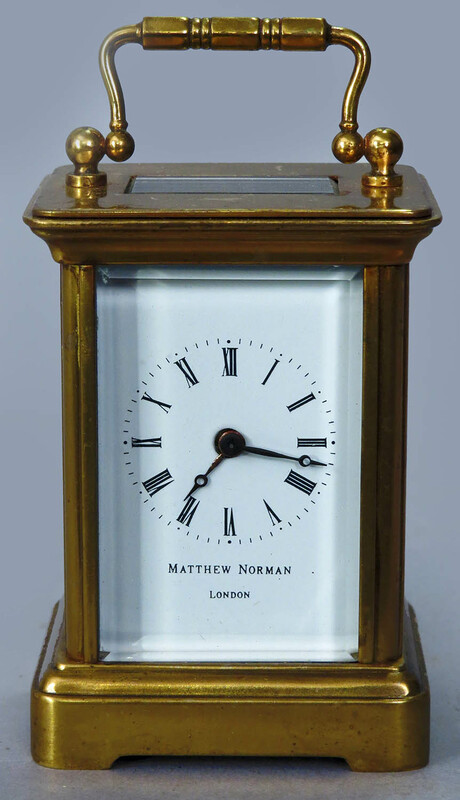 If you Google Matthew Norman, you will find that they are a contemporary company that produced high quality clocks faithful to the original designs. 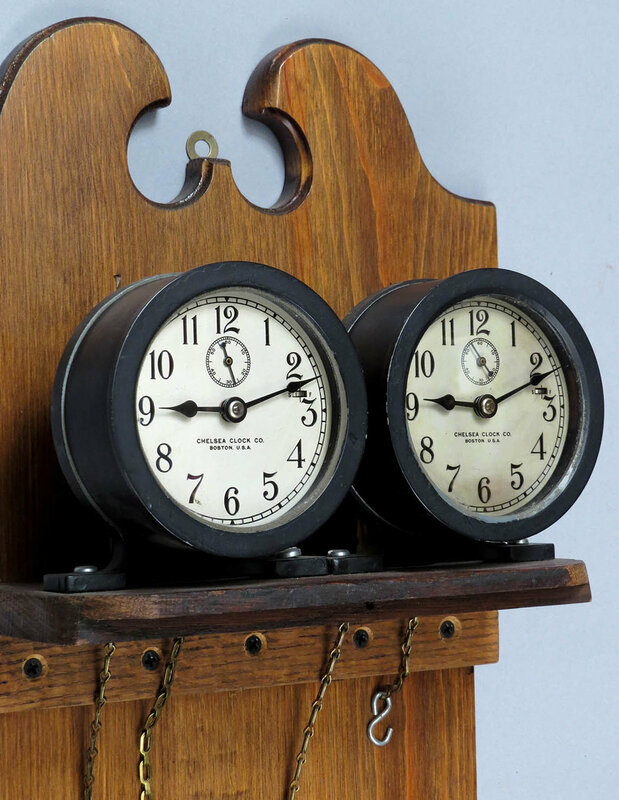 These are much more than simply reproduction clocks. They are of the Tiffany level. This clock has been very well cared for and is in excellent condition. It has a solid brass case, a good bright finish, a perfect signed porcelain dial, five perfect beveled glasses and the original hands. This is an eight-day timepiece with a lever platform balance escapement. It is running but stops often so it is due for a cleaning. 4 inches tall with handle, 3 inches without. $265. 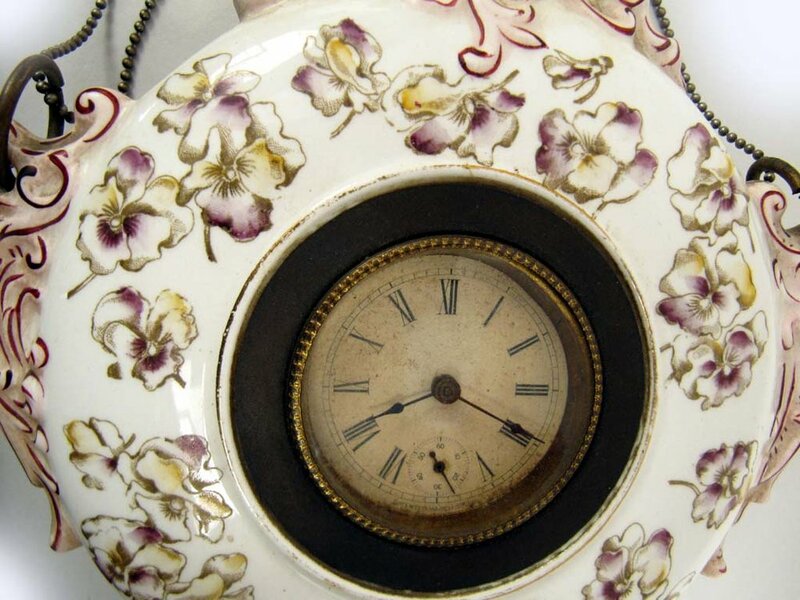 9101 Ansonia miniature porcelain clock. You have no excuse. If your collection has overwhelmed your home, there is still room somewhere for this cute little item. The porcelain case is in perfect condition without one chip or hairline. The signed paper dial is perfect, it has a pressed brass dial surround with beveled glass and the original hands. 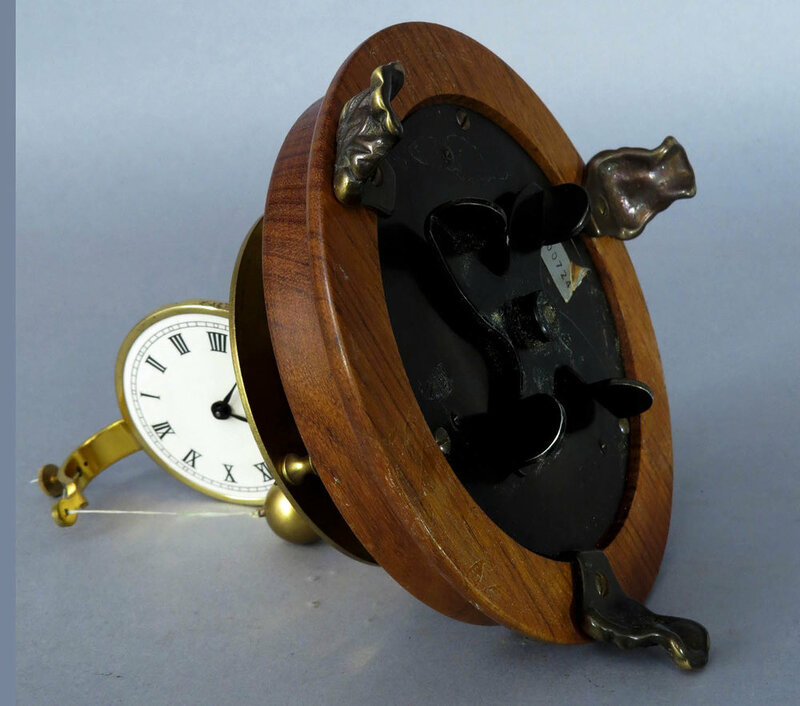 This is a one-day balance escapement clock and contrary to the norm, this one is running. Only 5 inches tall. $85. 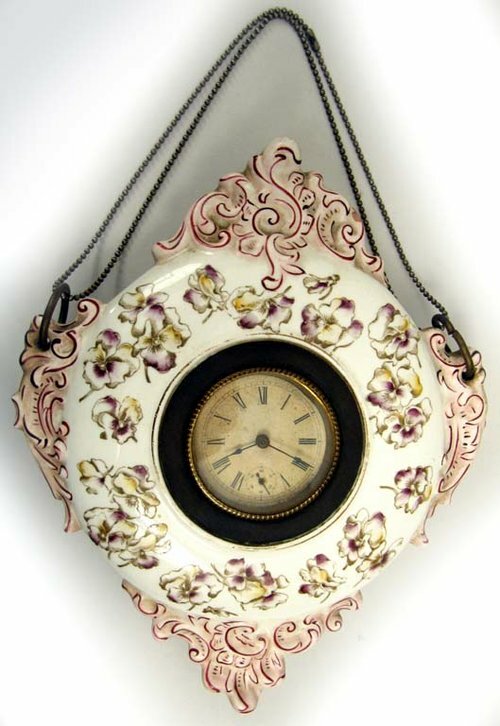 This is a cute little clock with a full bodied porcelain case. They are not common at all and I was fortunate to find this one. The background color is white with pink and maroon corners and a floral body. The case is near perfect with just one very small nick at one edge. The paper dial is in very good condition and it is patent dated March 5, 1889. The dial has a brass surround and the original hands. I am sure this is a one day clock but it is not presently running. The clock has a blue-green case with colorful flowers. There are no case chips, hairlines or any other damage. The paper dial is signed, in perfect, clean condition and it has a pressed brass surround and a heavily beveled glass. The hands are the originals. The case is marked in red “Made in Germany” and there is a sticker on the back indicating what was probably the original price of $2.25. That may not sound like much but the clock was probably made about 1900 and that was a fair amount of money back then. These little clocks are all one day timepieces with balance movements. I could not get this one to tick but I did not check the movement and it most likely is simply a case of needing a cleaning and oiling. This blue and white clock has a perfect concave porcelain face without any hairlines or chips. The hands and pendulum are original. This is an 8 day clock, time only, meaning it does not strike. It is in good running order.